Building of two forest rehabilitation enclosures in Sumatra for baby sun bears. 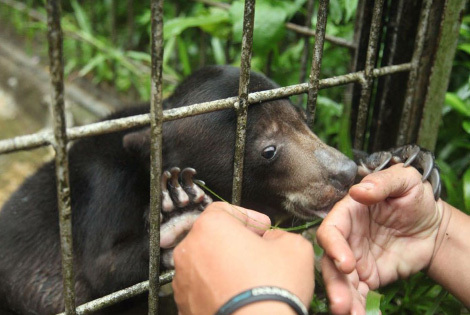 You may already be aware that the 2017 World Animal Day grant was awarded to the Jakarta Animal Aid Network (JAAN) led by Femke den Haas, our Indonesian Ambassador, to build two forest rehabilitation enclosures for baby sun bears. The enclosures will simulate the rainforest that the cubs love and know so well, allowing them to feel as if they’re living in the wild. Without mum around, it’s important the baby bears are fully rehabilitated and kept safe until they are old enough to take care of themselves, before being released back into the rainforest. Femke and her team are working very hard to get the building permits organised but it’s taking much longer than expected. To speed up the process, parts of the enclosure are being built in Jakarta and will be transported in sections to Lampung, southern Sumatra, by lorry. Meanwhile baby sunbears are being rescued and taken to other rescue centres. As soon as the centre in Sumatra is ready, the bear cubs will be moved to Sumatra where they will be rehabilitated and returned to the island’s rainforest. Joven, a three month old cub, was rescued by the JAAN team from an illegal wildlife trader in Jakarta. At the moment he is being cared for at a wildlife rescue station in Java and will be relocated to the new rehabilitation centre in Sumatra as soon as it’s ready. We greatly look forward to updating you about Joven’s story.